Risks of cloud computing on cloud technology is a vital issue to implement a cloud computing model. The cloud security specialist spends a lot on cloud application. How to secure the cloud is the vital question at present. However, some of the specialists arrange cloud computing training to avoid security threats. The risks involved in a private cloud, public cloud, hybrid cloud or even multi-cloud. SaaS, PasS and IaaS service providers are also offering some control measurement to avoid a risk of cloud computing on cloud technology. The criminals dislike working. They target any business network to trap. The cloud service accumulates data from hundreds of business network. The business thinks that the giant cloud service provider is capable enough to protect their data. However, when the business use cloud service the bad persons make the specific target to track the transaction history. The problem may arise from both ends like user end and cloud service provider end. The bad person may have a network to accomplish their target. When the bad person gets access then they make unauthorized access to business data. There is a tension at the vendor end of the business owner regarding the risk of cloud security. Statistics show that less than 10 % of big business goes for cloud computing. To tell very frank that very few financial institutions are going for the cloud application. There is a question regarding the transparency of cloud service provider staffs. It is unwise to keep sensitive data on the cloud network. Moreover, the character of vendors and the security of the cloud vendor is also a consideration. The business has to ensure the regulatory issue of data security. The list may be government service, healthcare, and banking sector but regulation is the must. Some of the compliance issues are where to reside the data, who is allowed to access it and how it is to protect. There is a consideration of government rules regarding the breach of contract, digital theft, and cybersecurity. Types of the contract is another issue. If it is not in writing then any time the vendors can deny the security issue. Another risk of cloud computing on cloud technology is the control mechanism. The question is who will control the database. The owner of the data is the business himself, on the other hand, the owner of storage is the vendor. So both should have the win and win situation. The main theme at this layer is trust. Another issue may arise during changing the vendor. Vendor keeps the user in such a way then the user has nothing to do. This problem is called vendor lock-in. 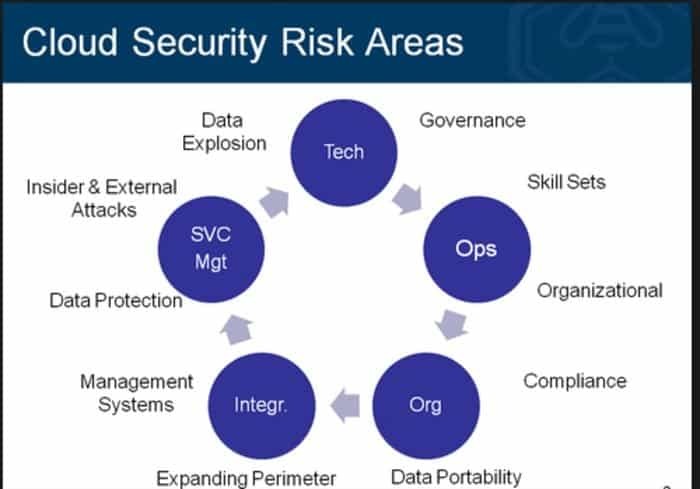 There is a lot of risk in cloud computing. Some of the major risks are 404-error-not-found, ISP risk, slow internet speed risk, the risk of unauthorized access, bad request, etc. Cloud risk of natural calamity like bad weather, Tsunami on the data center, DDoS attacks can be discussed with importance. Some cloud service provider offers 99% uptime which means 1% downtime. In 365 days 1% downtime means 3.5 days stoppage of work. Could you please imagine the business loss of 1% server down? I hope you have got a clear idea of what’s the risk elements available on cloud computing. We should always remember that technology doesn’t always bring benefit but comes with some disadvantages also. So while using any technology elements into our working environment, we must be more conversant about the concern matter.